Mywifenosevrything and Thewifedoesntknow are destined to meet again (of course!) 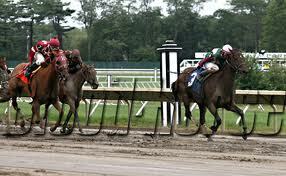 on Sunday, during the 8th race at Monmouth Park. This battle for the ages even extends to the trainers: Mywifenosevrything is trained by a woman, while Thewifedoesntknow is trained by a man. But here at ShowStable Artisans, we like to focus on what brings us together rather than what divides us, particularly when it comes to jewelry! Now, it’s true that there are times when you can take the matching thing entirely too far — all you have to do is let your memory wander back to the early days of line dancing and coordinated bib-shirt outfits to know what we’re talking about. You can make your connection clear while still being stylish. 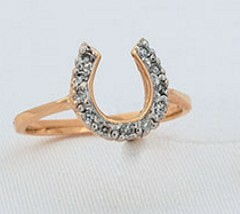 Check out these pair of rings: His features a matte gold background with .33 carat weight of diamonds. A bold, masculine ring that works well as a wedding or commitment band, this ring is a favorite among the men we know. 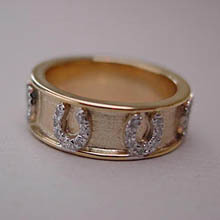 Hers is a classic 14K gold ring with .22 carat weight of diamonds in a striking horseshoe, timeless elegance paired with exceptional sparkle and shine. Imagine this couple holding hands, the love they have for each other — and for horses — evident for all to see. Will Mywifenosevrything emerge victorious after this weekend’s race? Only time will tell! One thing is certain, though…every time these two horses meet, people will pay attention!